Two weeks ago, hundreds of game industry professionals and industry hopefuls gathered for the fourth installment of East Coast Game Conference in Raleigh, North Carolina. While the southeast doesn’t quite have the bustling industry reputation of San Francisco or Los Angeles, attendees didn’t seem to mind in the least. That a show planned almost entirely by a board that has separate full-time jobs, competing with giant expos that bring in 30 to 70 thousand people, continues to thrive says a lot about the industry today. The expo hall, much like the show’s attendees, featured a unique split of well-established companies (Insomniac, Funcom, Red Storm), growing independent developers (Spark Plug Games, Mighty Rabbit), and industry-focused businesses, all rubbing elbows as they showed off their work and wares. Panels and presentation topics ranged from business to mobile and social gaming, along with a standalone track led by the region’s most recognizable name: Epic Games. Of these varied panels, one in particular provided some helpful insights into the continually evolving relationship between consumers, journalists, and public relations in the gaming industry. 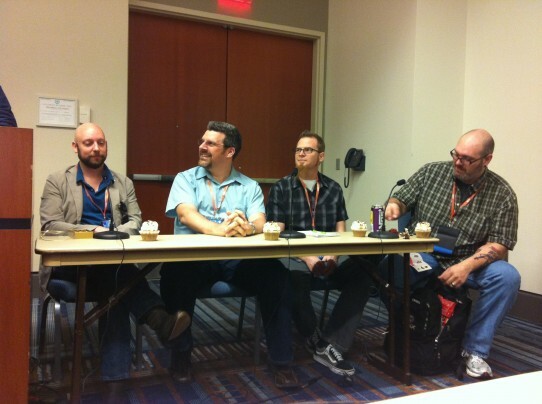 Within trappings of bourbon cupcakes and actual bourbon, covered to great effect by Kotaku’s esteemed Mike Fahey here, editors from Polygon, The Escapist, Kotaku, and IGN spent an hour going over some of the tougher ethical questions they face in their work. At the end of the final day, as the expo hall closed and the last panels wrapped up, the unique spirit of the NC Triangle’s gaming industry became a bit more apparent. Attendees lingered and chatted as they broke down their booths, some helping others as they packed up to head home and very few seeming in a huge rush to leave. While it’s true that hubs like SF and LA lead the industry in size, there’s a lesson to be learned in the continued success of the ECGC. No matter how competitive the space gets, or how much worry goes into predicting the future landscape, we’re all in this together in the end. Oh, and one more extremely important takeaway from the show: bourbon before noon can be dangerous. Drink responsibly, and preferably a bit later in the day. Cupcakes optional. Should Gaming News Report on Anders Behring Breivik?